Kelsey Anderson might describe herself as a "WAG", but there is more to being a tennis player's partner than maintaining your game face when the camera pans your way. The American married Kevin Anderson, now the world number 14, in 2011 after meeting the South African at the University of Illinois, and has been travelling full-time on the tennis tour for three years. It meant giving up an accountancy career in Chicago, a matter of days after being promoted. "I think that option is always out there but for now I'm just a tour wife, which is a little bit demeaning in a way, but I think I play a pretty big role on Kevin's team. "I don't let it bother me too much if people call me a WAG [Wives and Girlfriends]. I just kind of embrace it. If you can't beat them, join them." On Monday in New York, Anderson will take her seat at Flushing Meadows to watch her husband play Andy Murray, with the Scot's wife Kim in the opposite corner. "I know exactly how she feels sitting there," says Anderson. "It's tense and it's stressful and it's impossible to ignore those feelings. As much as sometimes we try, it boils over." Kelsey Anderson began charting life on the tour in a blog last month and it has already proved quite a hit, with Murray describing one effort as "absolutely fantastic" and husband Kevin saying other players have "really enjoyed it". Whether it is dealing with the regular defeats that tennis players suffer, coping with long-distance relationships, or describing the best and worst laundry, food and transport on offer, the blog details the hours spent away from the world's centre courts. "Bring a towel, because a lot of times you're sitting on uncomfortable metal seats. Obviously water, and I bring hats now because I'm really worried about sun protection. Sunblock, of course, and sunglasses. I always have my phone and my battery pack so I can track other scores. "Sometimes I'll check Twitter and see if anybody's commenting on Kevin's match or sending me pictures, which I really like. It's fun. I'm not going to be on Twitter while Kevin's playing a point but if somebody goes off to the bathroom and you have a five-minute break, yeah, I reach for my phone." "I feel like the wives and girlfriends don't get a whole lot of exposure beyond what we look like from the players' box," she says. "I'm really proud and excited to be giving a voice to some of the other women who commit their lives to travelling with their partners." Anderson estimates that she is one of three wives or girlfriends on the men's ATP Tour who travel to every tournament with their partner. Earlier in his career, her husband would often share a room with his coach to keep costs down, and her decision to join the travelling team was not without consequence. "Fortunately, when I started travelling with him he was ranked about 30, 35, so he's gone up and we can justify the cost of me being around," she says. "It was a big decision, though. Not only was I giving up my career and earning potential, we had to start getting an extra hotel room every week, we had to start paying for extra flights, extra food. "It's not insignificant and I think it it really is part of the reason why certain people don't come to every tournament - they just can't justify the cost." Those costs can begin to mount up pretty quickly - Anderson estimates that they spent between $40,000 (£26,000) and $50,000 (£33,000) on air fares last year, and approximately $1,000 (£700) to $2,000 (£1,400) a week on hotel rooms. "If you've got a team with you, you've really got to be earning money to cover your expenses," says Anderson. She deals with the business side of Kevin's career and so is responsible for booking those plane tickets, with the air miles and deals proving invaluable to make sure his 6ft 8in frame arrives ready for competition. That can often mean Kevin heading to business class while his wife sits at the less glamorous end of the plane - at least on the way to tournaments. "It's just not worth the risk of him showing up having pinched his neck because he's sleeping funny on the airplane," she says. "My job, and the job of the rest of the support staff, is to take as much pressure off Kevin as we can, so that all he has to do theoretically is show up and play." Her husband won £898,765 in prize money last year, but only reached his career-high ranking this summer at the age of 29, having turned professional in 2007. "Of course the guys at the top have great endorsements but Kevin's from South Africa; he doesn't have a federation funding him," she adds. "He's paid his own way every dime of his career, he's built it on his own merits, and it makes me really proud of him. He's managed it all really smartly. He's treated it as a business from day one as a pro." Despite the hours spent in airports, restaurants, gyms and hotel rooms, the focus remains on what happens out on court. That is when Kelsey Anderson and the rest of the team have to play their part from the sidelines. "Sometimes we'll say something like, 'stay committed'. That's a trigger word for him and he knows in his mind, when we say 'committed' he has a thought process and a target associated with that, so just the one word is significant. "He does give me feedback and we appreciate it because we want to do the best we can, within the rules obviously, because we're not allowed to coach, or say anything specific from the sidelines." Kim Murray, a veteran of 10 years in the world's player boxes, will be going through a similar routine on Monday. 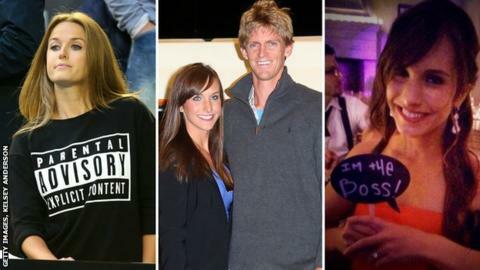 The then-future Mrs Murray became caught in a media storm at this year's Australian Open after images of her swearing went viral, prompting her to respond by wearing a 'parental advisory explicit content' t-shirt at the next match. "It's so tense and so emotional, I completely understand how that type of stuff happens," says Anderson. "I think it was unlucky for her. I think she's a lovely girl and I don't think that's reflective of her character or her values. "[The t-shirt] was the perfect response, I loved it. It showed her sense of humour and it was great." Anderson admits she gets very nervous when watching - "truly, on the inside I'm dying" - but hopes to stay on the road for as long as her husband is competing. "It's been an absolute pleasure to watch and to experience all of it and it's been so fun," she says. "I can't even explain how proud it makes me to have seen the development and really know how hard he works, and how much he earned where he is right now."